Preheat the oven to 180°C. Butter and flour four small round cake tins, 16 cm in diameter. Separate the eggs. Beat the egg yolks with the sugar and vanilla in a large bowl until pale and fluffy. Beat the egg whites to soft peaks in a separate bowl. Whisk some of the whites into the first mixture, then gently fold in the rest with a soft spatula. Add the flour and whisk again. Add the lime zest. Divide the mixture evenly between the cake tins. Smooth the tops with the soft spatula. Bake the cakes for about 10 minutes. They should be lightly golden, but not brown. Let them cool in the tin for a few minutes, then turn out the cakes while they are still quite hot. Let them cool on a rack in a single layer. Make the swiss meringue. Heat the egg whites and caster sugar in a metal bowl over a saucepan of simmering water, beating with an electric beater on medium speed. Increase the speed gradually, until the mixture reaches approximately 50°C. Pour the mixture into another bowl, off the saucepan, and continue to beat until completely cooled. The meringue must be smooth, supple and shiny. Take 2/3 of this mixture and incorporate the softened butter while continuing to beat for 3 minutes. The texture should be firm and creamy. Set aside the swiss meringue butter cream in the refrigerator for 30 minutes. Also set aside the remaining 1/3 of the swiss meringue in the refrigerator, to make the mane later. Make the eyes, ears and the horn of the unicorn out of the fondant icing. Start assembling the cake. Spread a layer of butter cream over a first round of cake, arrange a few raspberries on top, top with a second round of cake and press down lightly. Repeat the process and finish with the last cake round. Next, cover the whole cake with a first layer of butter cream and set it aside in the refrigerator for about 10–15 minutes. Cover with a second layer of butter cream and smooth the surface. The cake must be very even. If needed, refrigerate for 10 minutes and cover with a final layer of butter cream. Take out the remaining swiss meringue that was set aside for the mane. Divide between 5 bowls, leave one white and colour the others with yellow, green, blue and pink colouring, whisking in each colour well. Make 5 strips of colour side by side on a piece of plastic wrap, roll up and place inside a piping bag with your choice of nozzle. (See more detailed instructions on page 32.) Set aside in the refrigerator. 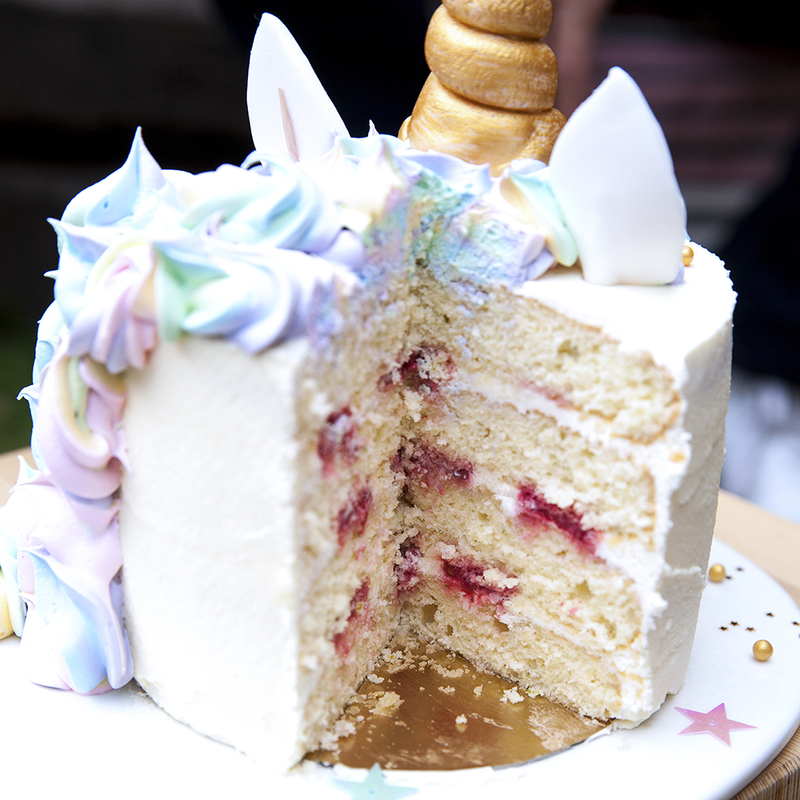 Plant the horn and ears on top of the cake, then pipe the rainbow meringue all around the horn and ears, making a mane that goes down the back of the cake and comes back around the side. Arrange the eyes on the side. Sprinkle with glitter or gold hundreds and thousands. 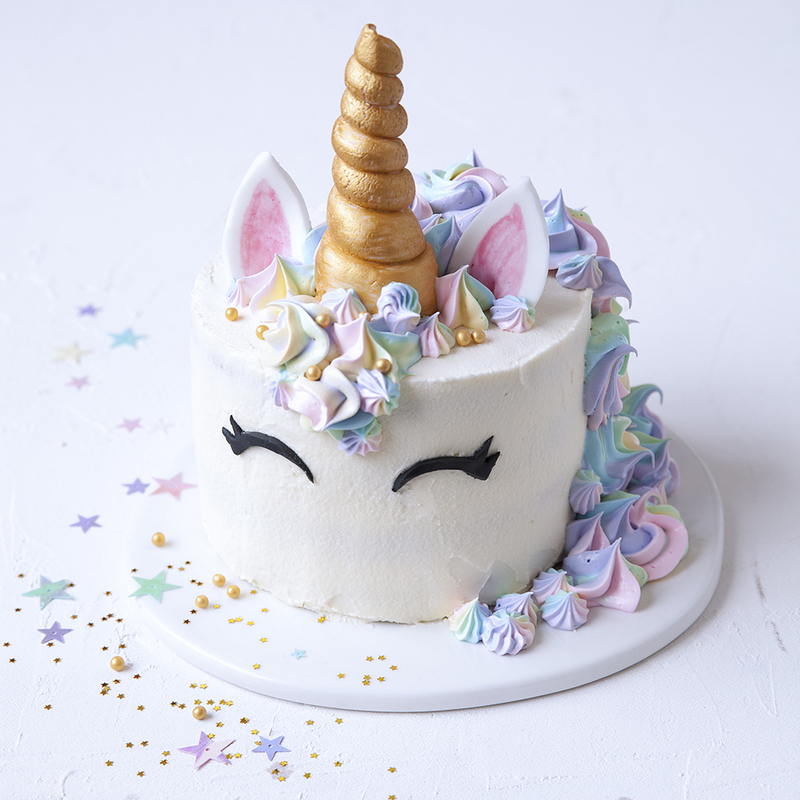 This entry was posted in Cook Books, Food and Drink, Recipes and tagged unicorn cake, unicorn food. Bookmark the permalink.